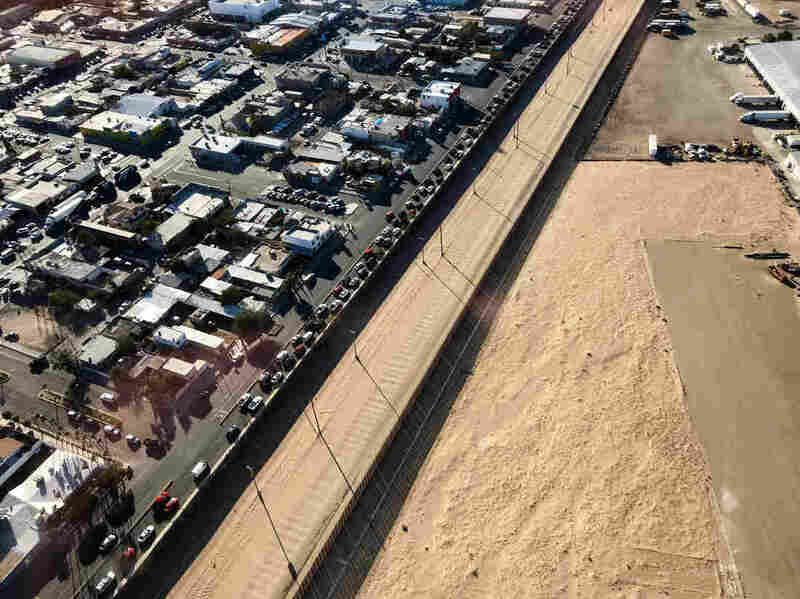 Behind The Border 'Crisis': Migrant Families Risk Dangerous Remote Crossings Large groups of migrants are crossing isolated parts of the Southwest border. Border Patrol agents call it a crisis, and advocates say immigration officials underestimate the migrants' desperation. Anthony Porvaznik, chief patrol agent for the Border Patrol's Yuma sector, inspects a recently reinforced section of border fence in San Luis, Ariz. Porvaznik says a few weeks ago, 350 migrants, including children, burrowed under another spot of the border fence about 12 miles away. About once a week, Border Patrol agents come across migrant groups of 100 people or more in some of the most isolated parts of the Southwest border. In Arizona, the number of migrant families and children crossing the border more than doubled last year, straining resources in the U.S. and Mexico. The White House says the situation is evidence of a broader crisis at the Southern border. On Friday, President Trump declared a national emergency to free up billions of dollars to expand the border wall. The administration wants a total of about $8 billion, including the $1.4 billion in the funding bill passed by Congress, for border wall construction. 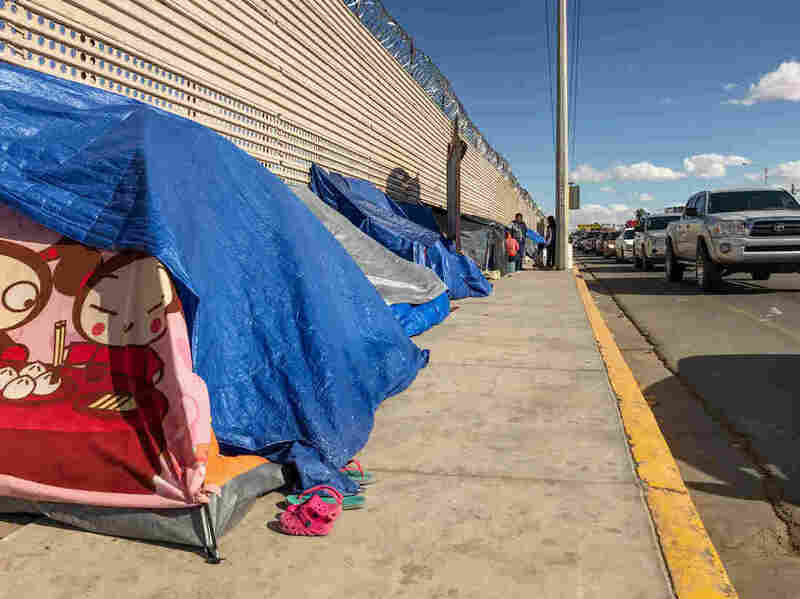 "We hesitate to use the word 'crisis,' because we don't think that this is a threat to the country," said Joanna Williams of the Kino Border Initiative, a humanitarian group that operates a migrant shelter in Nogales, Mexico. The vast majority of these migrants are fleeing violence and poverty in Central America. And Williams says U.S. immigration officials have underestimated their desperation to reach U.S. soil. "They're trying to find a route to safety," Williams said. "For them, the risks are worth it." Despite the recent influx of migrant families, the Yuma sector is widely considered a border enforcement success story. The number of illegal border crossings in Yuma today is just a fraction of what it used to be in the early 2000s. Former acting Homeland Security Secretary Elaine Duke touted the sector's turnaround in a 2017 op-ed in USA Today titled "Border Walls Work. Yuma Sector Proves It." The border wall between San Luis Río Colorado, Mexico, and Arizona's Yuma County. Even as Border Patrol agents "were arresting on average 800 illegal aliens a day," Duke wrote, "we were still unable to stop the thousands of trucks filled with drugs and humans that quickly crossed a vanishing point and dispersed into communities all across the country." "It was just to me like the wild, wild west. It was just out of control," said Barbie Moorhouse, a helicopter pilot in the Border Patrol. Before she was a pilot, Moorhouse worked on the ground as a Border Patrol agent in the mid-2000s. Back then, she says, agents ran themselves ragged chasing migrants who were trying to cross illegally. "We did the best we could with what we had at the time," Moorhouse said. "But it is definitely a better situation today than it was 10 years ago. The change was pretty dramatic." Since then, the Border Patrol's ranks have swelled. More miles of wall and fence have been built. And the number of illegal border crossings is far below what they used to be. But today, the face of those migrants has changed. Instead of farmworkers and laborers trying to dodge agents, nearly 90 percent of the border-crossers are families and children. Instead of trying to get away, they're trying to get caught. And once again, the U.S. is not prepared. 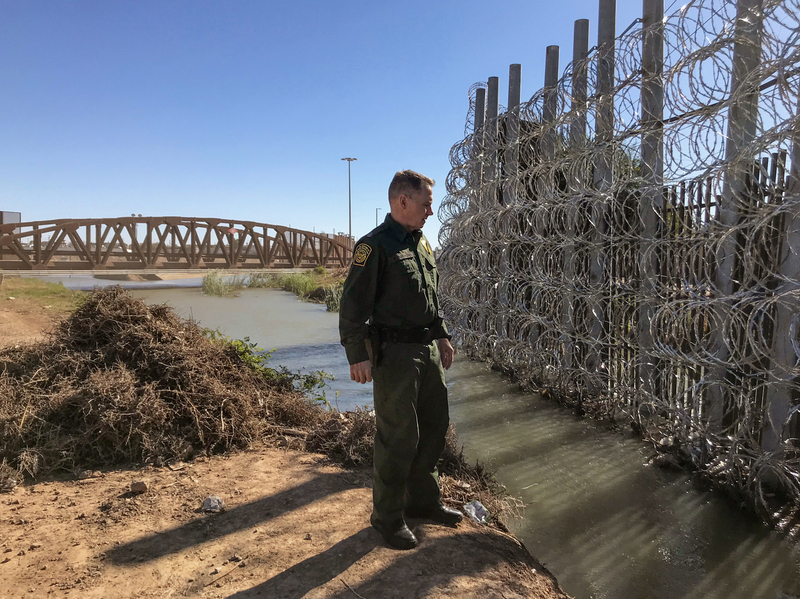 "It is a crisis for us because this is a situation that the Border Patrol is not resourced or geared to deal with," said chief patrol agent Anthony Porvaznik. Border Patrol agents are spending hours caring for the migrants in their custody, Porvaznik said. They pick up hundreds of hamburgers at a time from McDonald's and wait with migrants at the hospital if they need medical attention. We need additional manpower to deal with the population that we have to essentially babysit. "We need additional manpower to deal with the population that we have to essentially babysit," Porvaznik said. "And that takes Border Patrol agents away from a national security border security mission to deal with a humanitarian mission." Porvaznik says big groups of migrants have been especially frustrating, because they take his agents away from the law enforcement tasks they signed up for when the joined the Border Patrol. "We're here to arrest people that are trying to do bad things and bad people trying to come into the country," Porvaznik said. "And we still do that. But when we have this priority mission of having to deal with children and families, that takes away from our ability to get manpower out where we need them." Unlike the border-crossers of a decade ago, many of these Central American migrants are trying to turn themselves in to the Border Patrol to request asylum in the United States. "There's not an incentive to travel in smaller groups or to try to hide from immigration officials," said the Kino Border Initiative's Williams. So these migrants are crossing in larger groups because "in many ways, it's safer," she said. A few years ago, it was more common for migrant families to cross in places like the Rio Grande Valley in Texas. But Williams says that route has become increasingly dangerous because the Mexican side of the border is controlled by cartels. So migrants are crossing in remote borderlands, in spite of the risks. In December, an 8-year-old girl died in U.S. custody after crossing with a large group of migrants in a remote corner of New Mexico. Her death, as well as that of a second migrant child a few weeks later, prompted the Border Patrol to expand medical screenings for all migrants in its custody. There's another reason these migrant families have gotten more desperate, says Williams. In the past, they might have gone to legal ports of entry to request asylum. But since last year, U.S. officials have been letting only a few families in at a time at many ports of entry. So these migrants have to choose between two bad options if they want to reach the United States: They can cross the border illegally in remote areas, or they can wait, sometimes for months, in border towns. In the town of San Luis Río Colorado, right across the border from Yuma County, Ariz., hundreds of migrant families sleep out under blue tarps — the same kind you'd see emergency responders hand out after a hurricane. A few feet away, two clogged lanes of traffic also wait to get into the United States. Occasionally the drivers roll down their windows to give money to the migrants or buy them snacks from street vendors. Makeshift tents against the border wall in San Luis Río Colorado, Mexico, where migrants are waiting for a chance to apply for asylum. The migrants themselves keep track of everybody's place in line in a simple spiral notebook. On this day, the notebook is in the hands of a Guatemalan asylum-seeker named Herbert Leal. He flips through the pages to show me the names of more than 100 families from southern Mexico, Honduras, and El Salvador. Leal says they're waiting because they want to do this the "right" way. "To show U.S. authorities that we are able to wait," he said through an interpreter. "That we respect the laws of Mexico, and we respect the laws of the United States. That is why we're here." These migrants are afraid to leave this spot because they might lose their place in the line to request asylum. But some do venture to a migrant shelter in town called Casa del Migrante la Divina Providencia. "This house was made originally for men," explained Martin Salgado, who runs the shelter. Salgado's mother helped found the shelter in the 1990s. Back then, Salgado says, it was primarily a way station for migrant men trying to get to the U.S. to work. But now Salgado says the majority of migrants are women and children seeking asylum. "From a year ago, there's a lot of women," Salgado told me. "In the past, you didn't see this picture." Before, this was a place to bunk for a night or two. Now many of its beds are empty. But Salgado says the shelter has found other ways to serve the migrants. They come during the day to eat, to shower and to wash their clothes before returning to the line. Rosia Ramirez Penaloza and her children fled gang violence in southern Mexico. They're staying in a makeshift tent in San Luis Río Colorado as they wait for a chance to apply for asylum at the port of entry. "These are good people. 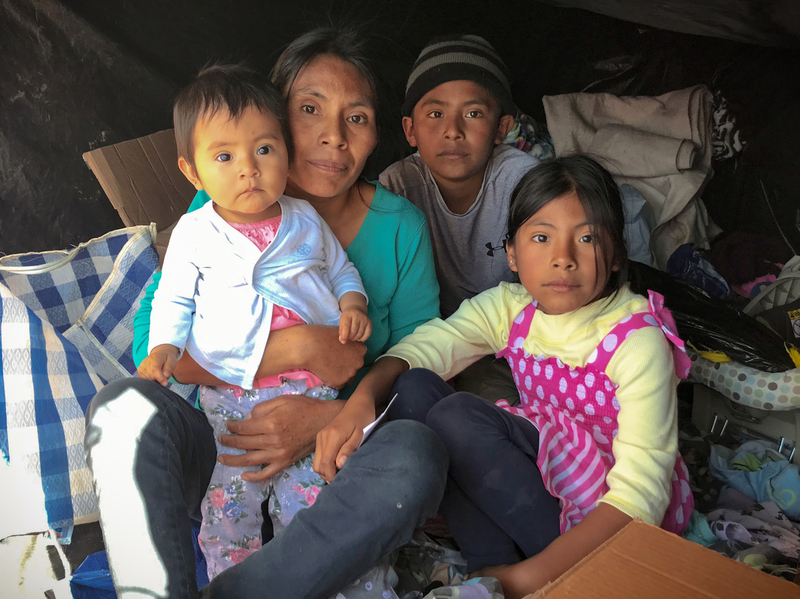 In my own village, I could not imagine anyone being as helpful and giving," said Rosia Ramirez Penaloza, a migrant who left Guerrero, in southern Mexico, with her three children. Her youngest daughter is 10 months old. She has another daughter who is 9 and a son who is 11. Ramirez says a gang member in their hometown tried to recruit him. "They would tell him that if he doesn't join them, they are going to hurt us," she said in Spanish through an interpreter. "Hurt his little sister and us." Ramirez and her children spend their nights sleeping under a blue tarp fastened directly to the metal border wall, along with hundreds of other migrant families, waiting for their number to be called. Back across the border in Tucson, Ariz., a shelter for migrant families and children called Casa Alitas has had to grow quickly to keep pace with the growing number of migrants. "We started back in 2014 in Tucson at the bus station," says Diego Javier Pina Lopez, the lead coordinator for the shelter. Casa Alitas moved into a house, which it quickly outgrew, and then two houses. A few weeks ago, the shelter relocated again, to its biggest quarters yet: a former Benedictine monastery in Tucson. The owner, a local real estate developer, is planning to build apartments on the property but is letting migrants stay there until construction begins. "We essentially got the keys on a Wednesday," Pina Lopez said, "and then we were told we needed to open on that Saturday." Most migrant families stay at the shelter for less than 24 hours. They truly believe that their lives are at risk and, even worse, the lives of their children are at risk. They're dropped off by immigration officials after they're released from custody, typically with a notice to appear in immigration court. The shelter offers them a place to shower, eat and sleep. Volunteers provide medical screenings and flu shots and help the migrants book their bus tickets to join friends and relatives across the country. One room in the sprawling 1940s monastery is full of donated toys. In another, piles of coats, jackets, backpacks and shoes are free for the taking. The staff members at Casa Alitas say it's unlikely that more miles of border wall will deter these migrant families from coming to the United States. "They truly believe that their lives are at risk and, even worse, the lives of their children are at risk," said Teresa Cavendish, director of operations for Catholic Community Services of Southern Arizona, which runs the shelter. "I think it will actually cause more suffering to have the walls in place," Cavendish said, "because folks will simply go to further extremes in order to make it here."